Narrative: Fabulous views of the Chickasaw Bluffs along the Western edge of the state of Tennessee and adjacent bottomland hardwood forests, including the bluffs at Fort Pillow (1st Chickasaw Bluff), Richardson’s Landing (2nd Chickasaw Bluff), Meeman-Shelby State Forest (3rd Chickasaw Bluff) and finally the sweeping view of the Memphis skyline, including the Memphis Bridge and the Pyramid, and downtown Memphis (which straddles the 4th Chickasaw Bluff). The vista from the river is unparalleled! 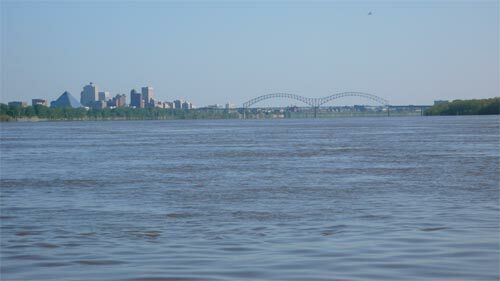 You’ve never seen downtown Memphis if you haven’t viewed it from the river! 1- Paddling big canoe to Hickman Bar, 2- picnic on Hickman, 3- paddling big canoe under the “M” Bridge , photos by Joe Royer, Outdoors Inc. 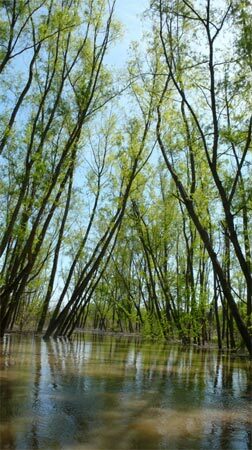 Points of interest include the scenic, the spectacular, and some sore spots, starting with beautiful Meeman-Shelby Forest State Park (3rd Chickasaw Bluff), Brandywine Chute, Hickman Bar, Mouth of the Loosahatchie River, Redman Bar, Memphis Wastewater Treatment (sore spot), Mouth of Wolf River, Mud Island, I-40 Bridge, Tom Lee Park, Beale Street Landing, Memphis Harbor, and finally the Pyramid and downtown Memphis (4th Chickasaw Bluff). 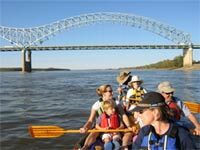 Put in at Shelby Forest and take out at the foot of Beale Street in the Memphis Harbor. 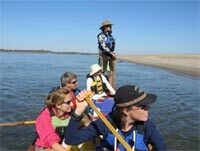 Total mileage = 18 miles on the Mississippi River with a sandbar supper on Hickman or Redman Bar.